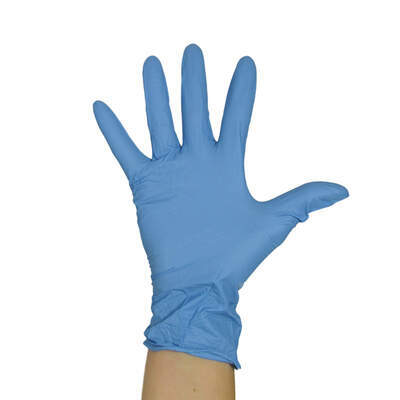 Suitable for anyone with an allergy to latex, our Gompels Soft Blue Nitrile Powder-Free Gloves are suitable for medical and everyday use. Each one has been designed with an ambidextrous shape that eliminates wasted time during application. A range of different sizes ensures you conform to existing hand hygiene regimes by wearing properly fitted gloves during work time. With their nitrile construction, they offer a higher resistance to oils, acids and most household chemicals - ideal for janitorial cleaning or use in garages. Being powder-free, they reduce the absorption and spread of environmental allergens. Food safe and industry standard blue for use in catering environments. Compliant with EN 374-2, EN 374-3 and EN455 Parts 1,2 and 3. Here at Gompels, we are proud of our extensive range of gloves. From our Powder Free Vinyl gloves through to Synthetic Stretch Vinyl Gloves, you'll find the perfect tool for your specific task.